I’ve mentioned before what a solitary pursuit writing can be. Since I’m back on deadline, my typical day consists of getting up at seven. And I’m soooo not a morning person. I see my son off to school and my preacher husband off to the church. By eight I’m at my desk with my second cup of coffee and I write until at least one thirty. When things are really flowing or it’s close to deadline, I write until three thirty when everybody gets home. During the day, I take breaks to run the washer and dryer or to move Alice the robot vacuum cleaner to a different room. I usually eat my lunch at my desk. On top of being home alone all day, though my loved ones are very supportive of my writing, nobody really gets the writer part of me. Not my husband, son, parents, extended family, or friends. But my writer friends are different story. They hear voices too. And we all think it’s normal. So while I manage to attend my monthly writers’ group meetings three to four times a year, conferences are a chance to see friends and make new ones. Just having so much creativity together in one room always stirs my ideas and gets my words flowing. 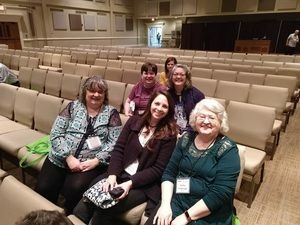 The Mid South Christian Writers Conference is an annual event in March of each year in Collierville, Tennessee. Though only three hours from me, I’d never been before. The day began with my road trip buddy, Linda Fulkerson. Linda and I have been to Minnesota, Indiana, along with Texas and Tennessee multiple times, in the pursuit of our writing. We started out attending and morphed into teaching. A few years ago, Linda and I started celebrating our writing milestones with pie. There’s a place in Keo, AR that’s famous for their pie. Since we hadn’t been there and it was just a few miles off our itinerary, we decided to try it out. The sandwich called the Keo Special was to die for. Avacado, turkey and cheese on a parmesan crusted toast. Yum. This is making me want another. Then there was the pie. Linda had coconut. I had caramel. Another Yum. 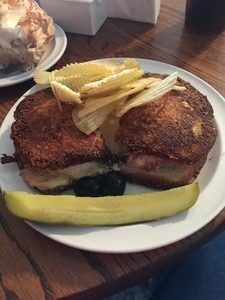 We were so stuffed, we decided if we go back again, we’ll split a sandwich. We caught up on our non-writer lives during the drive and brainstormed our books. Linda and I make a great team. She likes to drive and I like to ride so we’re the perfect road trip buddies. 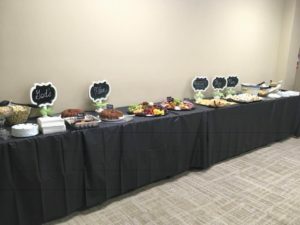 The conference began with a meet and greet with you guessed it–food. And we were still pretty stuffed. But it was good finger food type munchy stuff. We laughed and had fun while we munched. 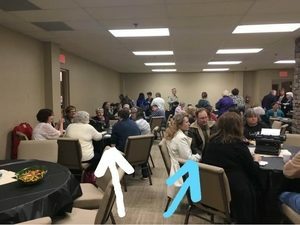 The two tables with arrows include our Arkansas group along with a few friends from other states. This is our room. We were both speakers and the conference organizers outdid themselves on our room. The next morning, I made the mistake of volunteering to play a game as an ice breaker before the conference. On stage. They told me it was a clue game and that’s about all I knew. So I get on stage with another Arkansas writer. Behind her the conference director held poster boards of the word I was to give clues for. My category-The Bible. The first few were pretty easy-Noah’s Ark and Jesus and the twelve disciples. My partner got the answers pretty quickly. And then the card said, I Corinthians 13. My mind went completely blank. I know my eyes got huge and I shook my head, mumbling something like, I am not the kind of person who can come up with Bible verses and where they are. Especially, this early in the morning (around 8 am). 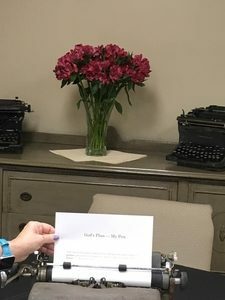 The conference director gave me mercy and went to the next clue. It continued to go downhill. I think we got three or four answers. Once I was off stage, it hit me–Duh, the love chapter. The next twosome got an easy category. Facebook – with answers like Profile, Bio, and Friends. They beat the fire out of us with seven correct answers. Lesson learned, don’t volunteer for any ice-breaker games. Especially early in the morning. I spent the rest of the morning, sitting at my table selling mine and Linda’s books while she taught her class. I attended a few workshops, then taught my class. Which caused a whole other issue. I had to buy a new laptop last year. It has HDMI only. I taught at a writers retreat shortly afterward and learned that most of the monitors are still VGA. My laptop wouldn’t hook to the monitor to show my powerpoint while I taught my class. Luckily, I had my class on a flash drive and another writer loaned me her laptop. I’m totally not technical and had no idea what I needed to fix the problem. This time, we thought we found a cord that would work after the meet and greet the night before. But when it came time to teach and display my presentation, it didn’t work. I ended up teaching my class without powerpoint and without any handouts. I had everyone in my class write down their e-mail for me, so I could send them the class when I got home. One of the Arkansas gals, Candace, has a techie husband, so he texted me what I needed to fix my future presentations. Guess what this girl got when I got home–a HDMI to VGA adapter. I’ll be ready next time. At the end of the conference Linda and our friend Regina from Kentucky played the password game. Their category was classic book titles. They knocked it out of the park since Regina’s day job is librarian. Despite my embarrassment over my failed password game and my lack of powerpoint, it was a great conference. I came home with new ideas and energy to pour into my book. That’s my traveling bud all the way to the left in the bottom photo, along with Cindy and publisher Kathy Cretsinger in the front row. In the second is another Kathy and Tonya. All the way in the back is April, the conference director that made it all happen. By the way, in case you haven’t realized it, I’ve been here at Inspy for officially a year. 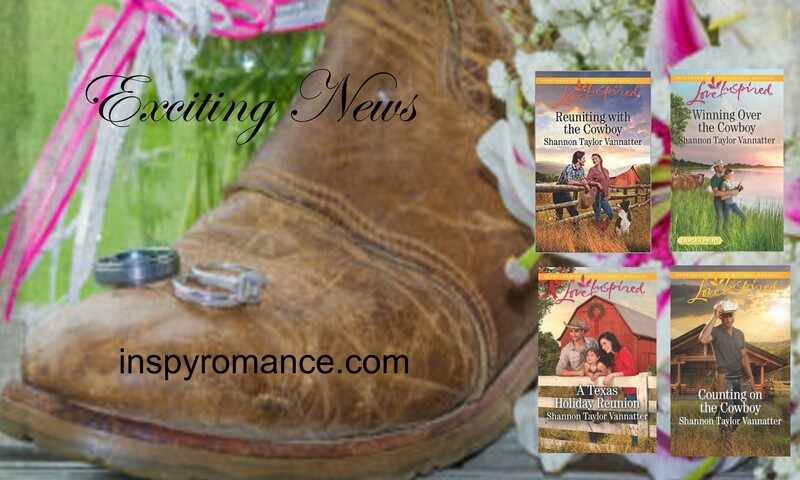 To celebrate, I’ll giveaway a copy of Winning over the Cowboy, print for US and e-book for international. Tell me your favorite dessert to get in the drawing. Deadline: April 19th, 11:59 pm central. Hi Shannon, happy one year anniversary:) This past year has certainly gone fast! Thanks for sharing about your conference- how nice to have a road trip buddy to share adventures with. My favourite desert- hmmm, I’m not much of a sweet tooth, but anything citrusy ie. orange almond meal cake or apple crumble are pretty good; in winter sticky date pudding or lemon self saucing pudding with coconut cream are winners. Yum, you’re dessert choices are making me hungry, Wemble. Linda and I are the perfect traveling buds. I wouldn’t travel near as much without her. Hi Shannon! Happy first year Anniversary! Thanks for sharing your road trip and conference experience. For this Michigander, my favorite place to visit is Tennessee and the Smoky Mountains. Our family enjoys road trips. Have driven to the Pacific Coast (California) and south to Florida. As our retirees are road trips are more local now – Michigan and Indiana. Wow! I have a sweet tooth and love desserts. My favorite is a Raspberry Bavarian Cream Roll from our local bakery. Also love lemon meringue pie or creamy lemon cheese cake. At our favorite restaurant I love the carrot cake. Best wishes and Happy Writing. I love going to Texas most, Renate. I tell everyone it’s my second favorite state. The only thing bad about it and my home state of Arkansas is the heat and humidity in the spring and summer. I think I could pretty happily be a snowbird and live somewhere north during those months. Yum on your dessert choices. Hi Lucy. I like Orange Creamsicle homemade ice cream. Yum. Happy Anniversary! So nice getting to know you better! My favorite dessert is my homemade cheesecake – a family recipe handed down for generations! Thanks Paula. I really enjoy the blog and chatting with readers. I love cheesecake. I call cheesecake pie. Linda argues with me that it’s not pie. But it’s not cake and it’s a lot more similar to pie. My favorite dessert is the S’mores ice cream I get at a local dessert shop called Kilwin’s. Yum! Oh wow, I haven’t tried that one Susan. I do love ice cream. I love death by chocolate and old south pecan. Oh goodness, I so hear you. My brain really doesnt kick in until around 9am. I know what verse that is also, but at that time in the morning, I would have been lost also. How wonderful to hear voices in your head for books. I see patterns and colors. I put a lot of them into quilts and projects for the house, like pillows, table runners etc. My favorite dessert is Cherry Carnival. It is a yellow cake with cherries and a hot cherry sauce that goes on top. This was the cake I always asked mom to make for my birthday. My husband continued with it when we got married. My brain doesn’t kick in until noon, Lori. Now that’s cool on the patterns and colors. I sew window toppers, bedspreads, comforters, and bed ruffles, but I don’t see them in my head first. I don’t sew clothes. With window toppers if you make a pucker it doesn’t matter. That cake sounds awesome. Happy anniversary!! Glad that I’m finding you on here!! My favorite dessert is a bowl of frozen yogurt!! Thanks Trudy. I really enjoy being here. I love frozen yogurt too. I love the cover of that book! I’ve only been to two conferences and both fairly local but enjoyed them both. This year I’ll have friends at them so that will improve the experience. Thanks Dalyn. I love conferences. I’ve made friends from all over the U.S. The only bad part is not seeing them often. I have lots of foibles and could never pretend to be perfect. Happy anniversary!! I love that you decided next time to split the SANDWICH at the restaurant – but not the PIE! Lol!! It was a great conference, and even better getting to see YOU! Favorite dessert? My mom’s Fudge Subdae Pie. Oh. My. Goodness. It’s the one we always request for birthdays! I loved seeing you too, Regina. You got to witness my brain go numb. And you can never go wrong with Sundae, no matter how you spell it or if it’s pie or ice cream. My favorite dessert is cherry cheesecake! Hey Lila, I’ve always been the type who hated to get up in front of people. But somehow once I got published, I wanted to help others achieve their dream. I absolutely love teaching and sharing what I’ve learned from editors. I’m with you on cheesecake. But I like blueberry. Yum. Hi Shannon! Ain’t technology grand? In my dayjob I used to work in IT for an insurance company. TONS of systems, all with different technology paths. TONS of chances for a mess-up. And I was one of the many who would get the phone calls (usually in the middle of the night) that something was down or wasn’t working. My first thought was usually, “It was working when I left work at 5. Why is it suddenly not working at 2 AM?” GOTTA LOVE IT. Glad you worked through your technical issues and still had a great conference!! Hey Laurie, I love IT people. They can fix just about anything. Except when you don’t have the right adapter. I am so NOT technical. My favorite dessert is my grandmother’s Mahogany Cake, a chocolate cake with caramel icing with pecans. The icing is tricky because you have to cook it to just the right consistency – which is fleeting. I have made it, but it is never as pretty as Grandmother’s was. But it still tastes yummy. Anything with caramel and pecans is right up my alley, Betty. Turtle anything is my all time favorite dessert. Pie, cake, ice cream sundae, candy. Any way you want to mix chocolate, caramel, and pecans, I’m in. Cannot wait to discover all the books I have been missing in my life! Thank you for sharing yourself! Happy reading, Rhonda. I try to have fun and laugh at myself. 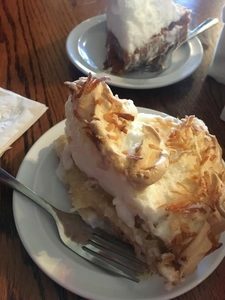 My favorite dessert is coconut cream pie, hands down! 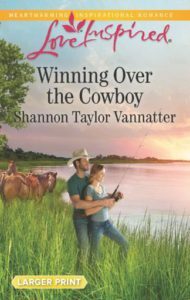 I already have Winning over the Cowboy and love it! I just wanted to drop by and say I also had a great time with you and everyone else at Mid-South. Can’t wait till next year. I’m so glad you got to be there, Candace. And your techie husband tried to save my life. Should have gone to Walmart. He still saved me since I knew what to buy when I got back. It’s safely tucked in my conference bag. I love Angel Food cake layered with ice cream and a little drizzle of frosting across the top. My Mom used to make it for my birthday cake when I was growing up. I’m a big fan of most desserts, but I really love ice cream. It isn’t a fancy dessert, but I love it! I love ice cream too, Melynda. I mean is there anyone who doesn’t. My husband and I rediscovered a love of fudgesicles recently when we both had sore throats. The sore throats are gone but our new addiction is still in the freezer. I love desserts but will have to say a lemon meringue pie is a favorite. Oh, that’s another good one, Kathy. I am not much of a sweets/dessert type of gal, but I do absolutely love german chocolate cake. That has to be the best dessert ever! Yes, Lisa! I love German chocolate cake. Yum! Ice cream! But I won’t say no to anything chocolately either. I’ve never turned down chocolate, Jessica. Ever. Happy Anniversary Shannon. My favorite dessert is Black Forest cake. Thanks Maryann. That’s pretty yummy too. Favorite dessert? That is difficult. Umm….probably hot apple pie with vanilla ice cream.